Come and enjoy a holiday by the beach in our spacious luxury architect designed Mediterranean style Villa. The property has raked ceilings which makes it very specious. Ceiling fans in living area and bedrooms. Aircon in the lounge and open fireplace for log fire in the winter months. Casa Del Mar has 2 bedrooms, master bedroom with king size four poster bed. The second bedroom has a double and a single bed, plus a pull out single mattress. TV in master bedroom, large Flat screen TV in lounge, DVD player and VHS player plus a surround sound system. Recently renovated bathroom with bath plus a hot and cold shower outside for use after beach or pool set in a Balinese type area. The property boasts a fully equipped kitchen with Stainless steel fridge/freezer and dishwasher. Full laundry facilities with washing machine and a bar fridge. Casa Del Mar also has a Pool set in tropical gardens. 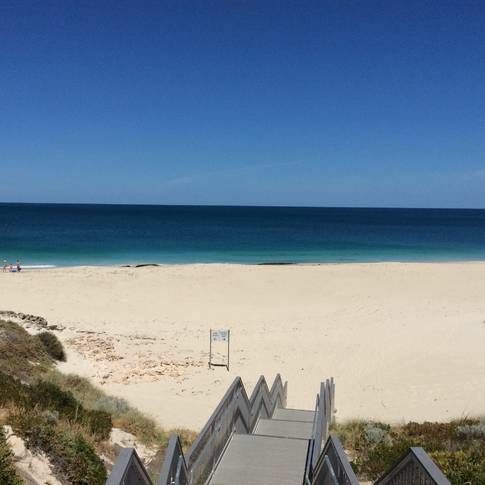 Casa Del Mar has direct access to the famous Yanchep Lagoon beach. The sandy beaches stretch for many kilometres along the beautiful Indian Ocean , where everyday ends with a spectacular Sunsets. The beaches provides both surf and a protected lagoon that is safe and great for young children. At certain times of the year Whales can be see migrating either North or South. Fishing is also great with a great variety of different types of fish at different times of the year. Close locality to beautiful lagoon beach, close to Suncity golf course, Yanchep national park with historic hotel and restaurants. This is beautiful Mediterranean style villa, very clean and cosy. Really enjoyed our 2 nights stay. The villa is 250 meters from the beach and has very easy access, down the path and cross the road. We apologise for the BBQ this has now been rectified, but found that the ignition did not work so left matches to light BBQ. In regards to the steps we usually advise guests, obviously this did not happen. The villa description has been revised of the steps coming down from Arney Court and the easier access is from Brazier Road. Thank you for your feed back. The house itself is lovely and is well laid out and furnished. Unfortunately there were quite a few things that let the property down. In order to access the property from the driveway you need to walk down some seriously steep limestone steps. Although the pool is lovely it's let down by the poorly maintained communal gardens and there is no BBQ or furniture at the poolside either. We found that the gas BBQ at the property didn't work and was too dirty to use anyway. Inside and outside of the house there were a lot of cobwebs and dust in certain areas so we had to do some cleaning when we first arrived. The tv only had about 4 working channels and the DVD player was quite difficult to use also. The windows don't open in the master bedroom and the fan was also quite difficult to get going. I think a good clean and a check of the utlititys and this property could be greatly improved. In regards to the limestone steps we have now put a description of access from Arney Court with the steps and easier access with only a few steps from Brazier Road (through 38 Brazier Road, through carport and gate. We do have a gardener and we a have a working bee to clean up and cut back to coincide with green waste collection. It is disappointing that the BBQ was left in this condition, as it is written on the BBQ please clean after use, Our cleaner will check on guests departure and let us know if I need to clean the BBQ. thank you for your feed back.